X-Wind Power Limited is designing 80 kW vertical axis wind turbines and when deployed there will be an Ignition cloud-based SCADA system for data collection, data storage, and visualization. As part of the turbine design process, a recording, visual, dynamic mathematical model of the turbines’ “aero to electrical output” and safety systems was required and this has successfully been achieved using National Instruments’ LabVIEW. The control system engineer said he I couldn’t help thinking to himself, “I’m sure I could do that with Ignition,” and that it would help him understand the mechanical dynamics as well as underline to the team just how powerful Ignition would be for the main SCADA system. This Ignition project is unusual as it has less than 100 tags, no devices, and the only external input is the one-second wind data stored in a MySQL database table that can be adjusted with a multiplier. 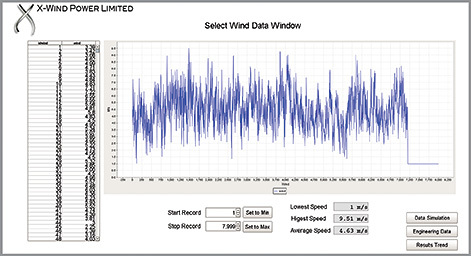 A data selection page allows a wind data period to be selected. 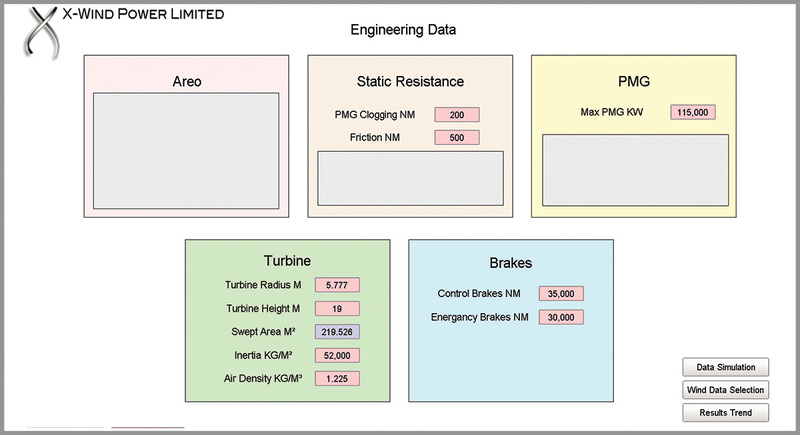 There is an engineering page that has a number of product variables attached to memory tags that can be adjusted. 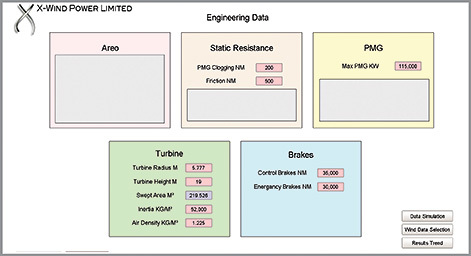 The main simulation page has some critical tag visualization and buttons to operate the tests. There is also a data trending page that has an easy chart component so all the data can be seen as a trend and exported if required. 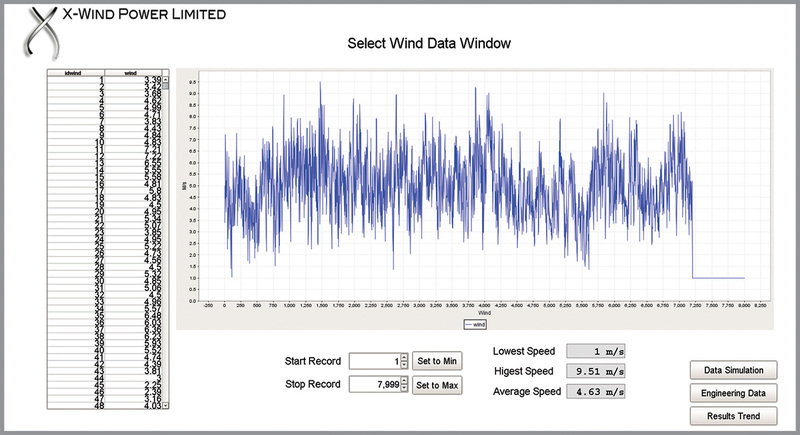 All of the calculations are performed in a script module that is called each time a new wind record is read from the database using a short tag change script. The historical tags use a dedicated scan class that is driven by a bool tag that is on when the simulation is running, this tag runs at 50 milliseconds fast and 600 seconds slow, freeing up server resources when not in use. The script imports a Python math library and uses various math functions and up to 6 order polynomial equations to calculate the required system curves; it imports the required memory tags and then it then calculates all the aero data, turbine RPM, acceleration/deceleration, rate of change of speed, shaft power, electrical power, braking, friction, losses, etc. Once done, it then writes all the new values back to the memory tags. This script executes in less than 1 millisecond. As data iteration progresses, the data is written to the data history and the visualization is updated. In the future, the scripting may be extended to include temperature rise for the generator, inverter efficiency, temperature rise for the brakes, brake wear, predicted yield, and basic bending forces on the major components and so on. The Ignition model seems to be as accurate as LabVIEW (it’s only math, after all) and the team are now including the Ignition model in their system modeling needs, and going forward this could be a great time-and cost-saver. One huge benefit is the ability to run the system on multiple clients without going to a dedicated machine. This is not a big project and just uses the most basic modules in Ignition, yet it has enabled X-Wind to model its system in various wind speeds so that it can see the outcome of any change in the product such as size, generator efficiency, friction, and braking, etc. Overall, the use of Ignition as a system model has exceeded all expectations and will continue to be part of the design process. In the future, it may also be possible to use Ignition and the data it produces as part the information X-Wind provides for product certification. Using Ignition’s easy graphing ability to show a visual representation of the data conveyed, and the leg path that is being utilized. 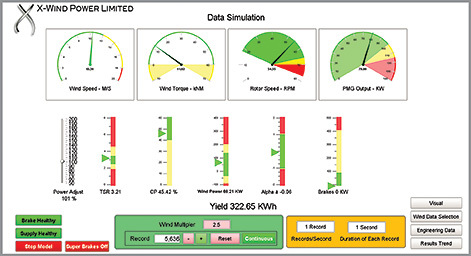 With the ability to input different values, X-Wind Power Limited is able to test every scenario to achieve their desired result. The main overview screen shows the results of all the calculations.